Saturday mornings with nothing to do…………… It doesn’t happen very often around here, but when I do have a free morning, I love to experiment with breakfast recipes. Some experiments turn out to be delicious recipes and some turn out to be garbage. Have you ever seen “that” look? The look that says, “Mommy I love you, but I will not eat this even if you pay me a million dollars.” I bet you have. I can assure you that I don’t share those recipes here at Juggling Real Food and Real Life. 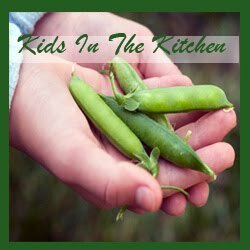 I like to share recipes that are “picky kid” approved. This sweet and delicious breakfast is packed full of lots of great nutrition. Whole grains and a variety of fruit combine to create a satisfying breakfast. Mix a few ingredients, toss the dish in the oven, snuggle your little ones for a bit, and breakfast is ready. This Kitchen Sink Baked Oatmeal comes out of the oven warm and bubbly and oh-so-good. I love the crunchy top and soft middle that you get when you make baked oatmeal in a casserole dish. This recipe is extremely versatile too. 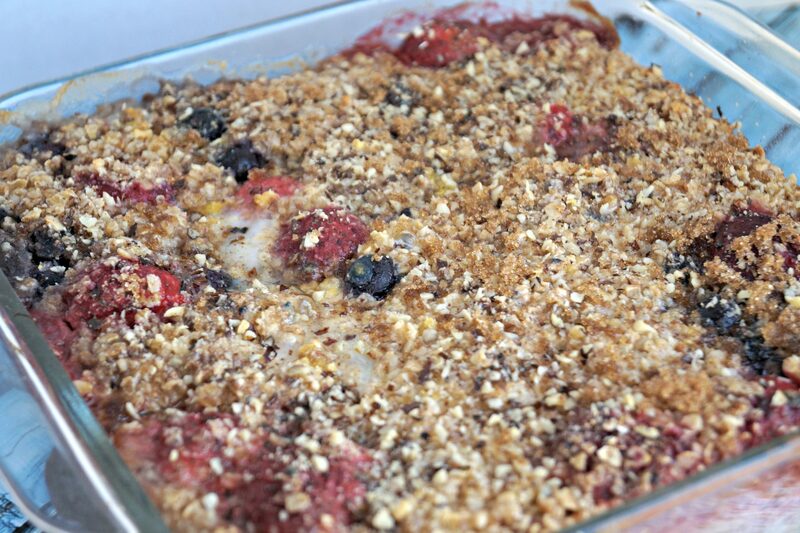 I made my Kitchen Sink Baked Oatmeal with frozen berries because that is what I had. You really could use any fruit that you have on hand and it would be delicioous. That is the beauty of a “kitchen sink” recipe. Anything you have in the kitchen works……your choice of fruit, chocolate chips, chia seeds, nuts, hemp hearts…………..you get the picture. I sprinkled the top of mine with crushed walnuts for a little extra crunch. Additional Berries and sliced Banana to top if desired. Grease a 10x10 casserole dish generously with butter or coconut oil. 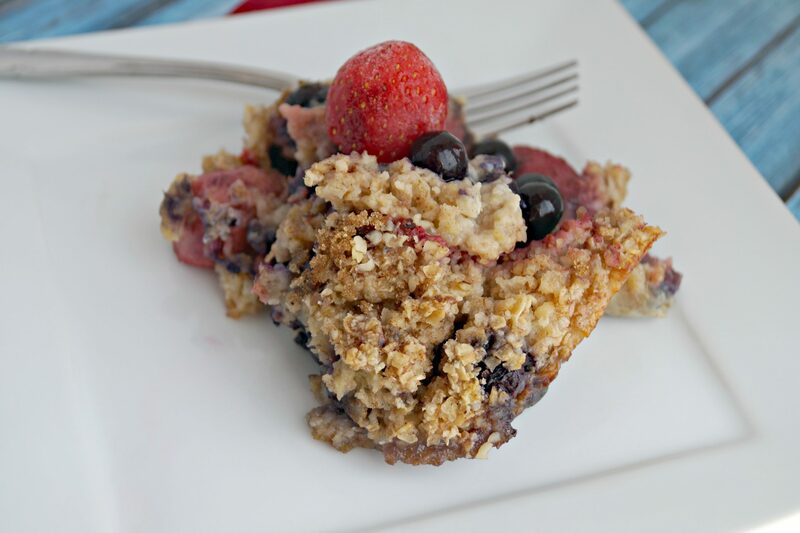 In a large bowl, mix oats, baking powder, cinnamon, salt, & berries. Stir well and pour into casserole dish. In a separate bowl, combine milk, egg, smashed banana, coconut oil, maple syrup & vanilla. Whisk thoroughly. Pour on top of oatmeal mixture, making sure the all oats are soaked evenly. Bake for 35-40 minutes. Top of the baked oatmeal will be golden brown. Enjoy! This recipe lasts a few days in the refrigerator, although it does lose its crunch with time. It can be eaten cold or warmed up. It is good either way. I’m really not sure which way we prefer it. Maybe, it just depends on the day. Let’s get the conversation going. 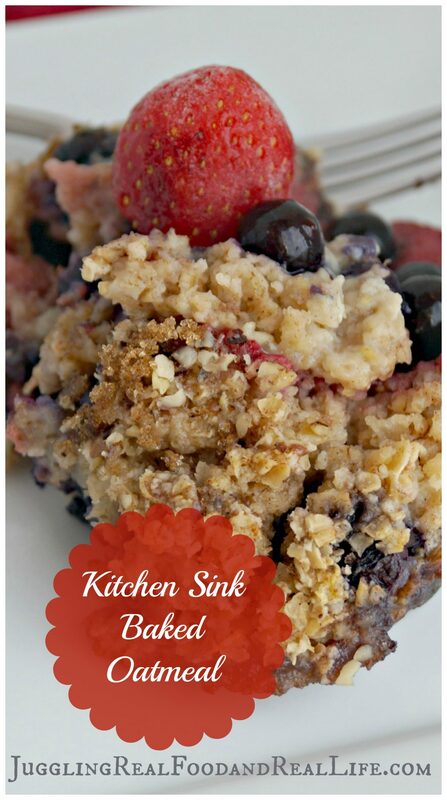 What would you include with your Kitchen Sink Baked Oatmeal? Leave me a comment and let me know. I’ll try it the next time and have a free morning. Maybe you will see your idea shared in a future recipe. If you like this recipe, you might also like the Blueberry Baked Oatmeal which is made in muffin cups. Click the image below, for the recipe. This looks delicious, Christina. Unbelievably, I have never made baked oatmeal. I am definitely giving this one a try. It really is delicious Gaye and so easy to make. Toss together a few ingredients and enjoy! I love baked oatmeal! I usually use apples and pears but this one looks fantastic. I’m pinning to try some day soon. Apples and Pears in baked oatmeal sound fantastic! I’m used apples before but never pears. Thanks for the suggestion. All I can say is YUM! This looks so good…can’t wait to try it! Let me know how you like it if you try it Janelle. The baked oatmeal comes out soft in the middle and crunchy on top. It’s rather like an enormous oatmeal cookie. http://jugglingrealfoodandreallife.com/2016/03/lets-get-real-friday-party-135.html. It looks yummy. 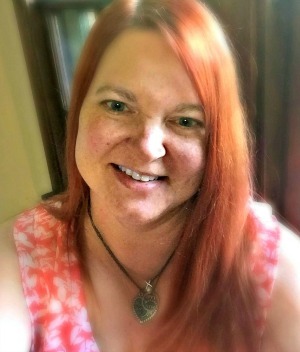 I just linked up with Spring Colors to Delight and Entice. I’ll try out this recipe with rice milk and without the egg as I’m vegan. I use flaxseed meal instead of eggs- Here’s how to make an egg replacer. Combine flaxseed meal and water and allow to sit for about 5 minutes. Add this ingredient to your recipe as you would an egg. One of the things I love about baked oatmeal is how versatile it is. You could leave out the egg completely or use the flaxseed sub. Either way I’m sure it would be great. I love baked oatmeal. Love that yours has a lot of fruit in it. I would change out the milk for coconut milk since I try to avoid dairy. I also like protein for breakfast. I might try adding in a couple of scoops of protein powder and leave out the banana. Thanks for sharing. Definitely pinning it. Coconut milk would be great in this recipe. I do love to have lots of fruit for the color and the nutrition. I’m a protein in the morning kind of girl too. A slice of bacon makes me happy. You make the most amazing food items, and you make it look effortless.